I’ve looked over my photos from the previous week, and boy have I been busy with little projects. The garden is finally getting there! This was going to a post about the birds that visit my garden……. 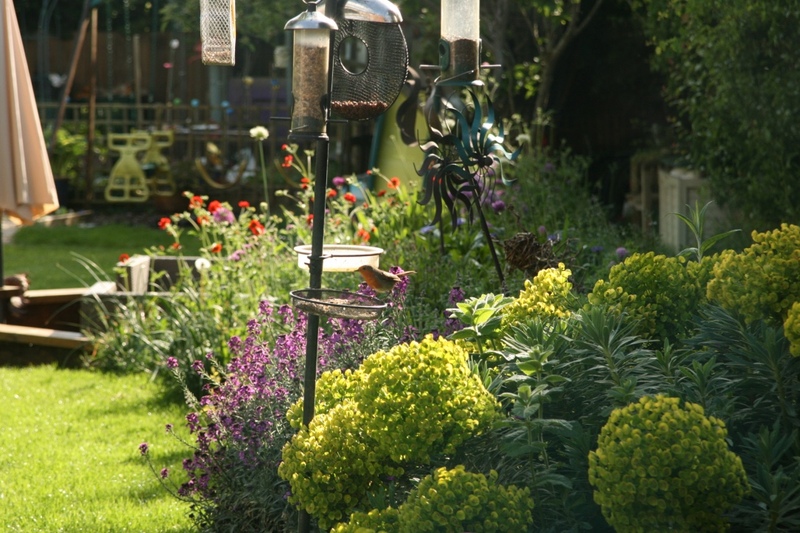 spot the robin on the feeder? Well as soon as I decided to start taking photos – half the lovely little birds have stopped coming to visit! The goldfinches rarely put in an appearance now, and it seems we have wood pigeons and robins currently – maybe with an occasional blackbird so it wouldn’t be exciting reading and viewing! 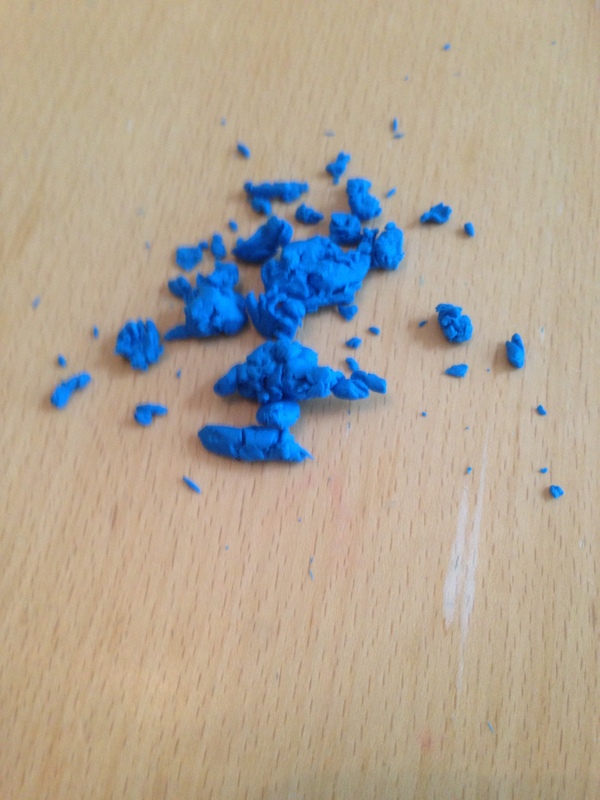 I bought some fake Fimo clay from the local market a couple of weeks ago. 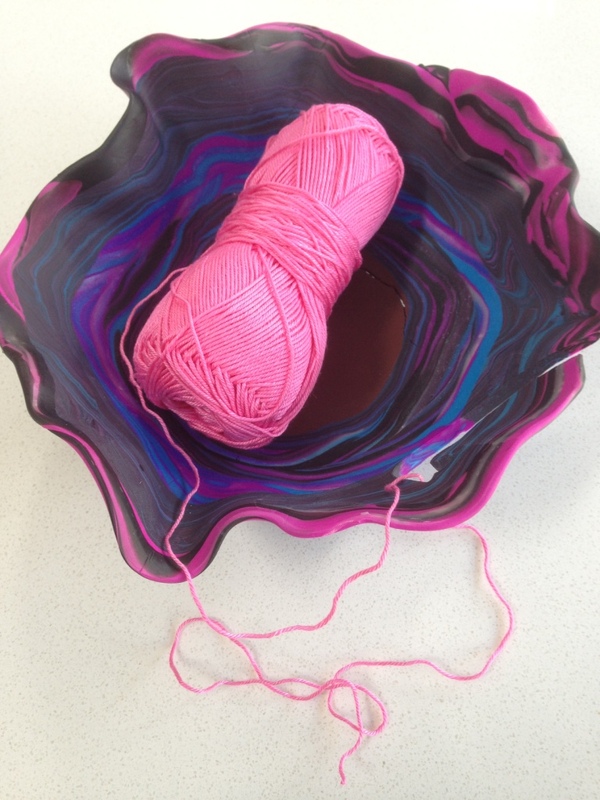 I’ve played with it on some hooks, but I saw this fab post about making a Yarn bowl here. 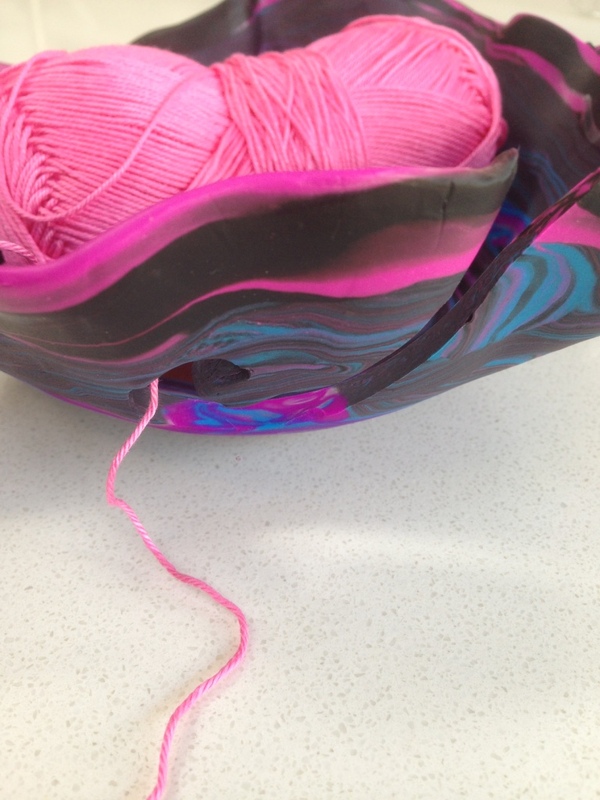 I’ve recently been using normal double knitting balls of wool – finishing one of the never ending WIP’s I wrote about a couple of weeks ago – and the wool was boinging all over the place. Very annoying so I thought – hey – lets give it a go! 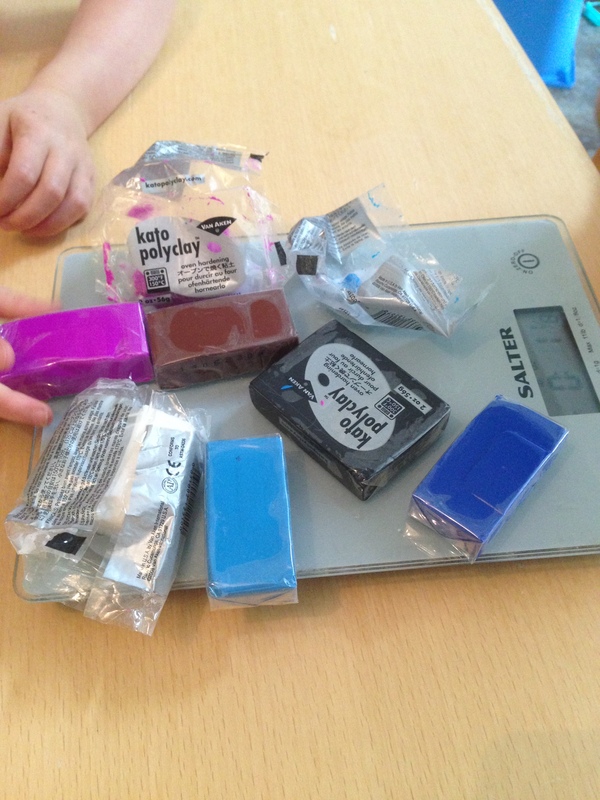 I needed about 7 oz of the cheapo modelling clay……. and boy it was nasty stuff to use! Every time I rolled it and tried to heat it up it went into nasty little balls! I got some more expensive stuff from a craft shop, and it was a dream to use, just rolling nicely exactly as is should do in seconds rather than 10 minutes to get the other stuff usable. 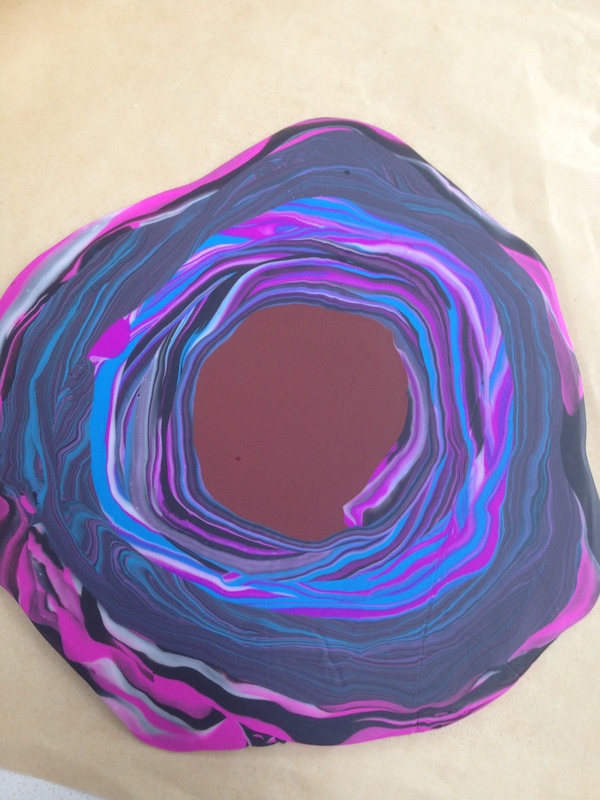 So we (me and my 2 trusty helpers) are attempting a marble effect that another kind blogger shared here. 4 worms – at this point both little people started singing….. Yes – it’s gets completely stuck in your head for days……. 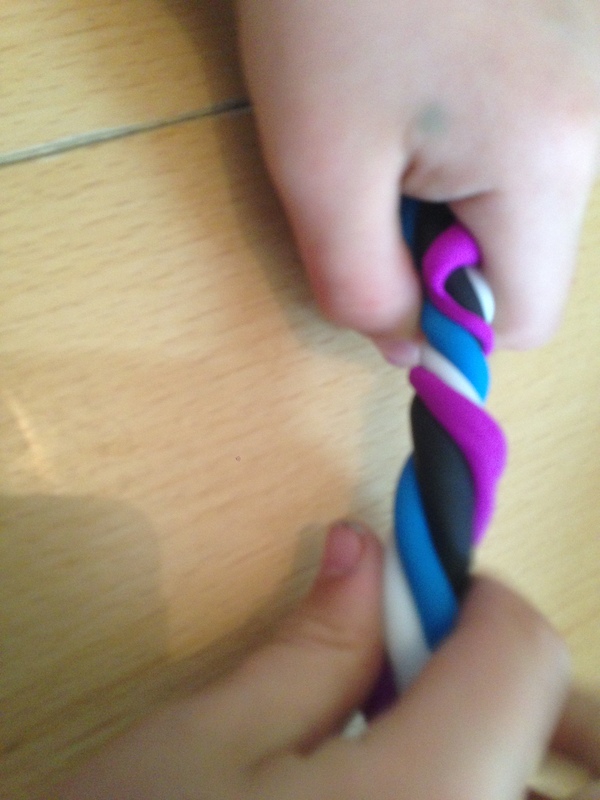 Twist them together and keep twisting……..(Very out of focus photo). 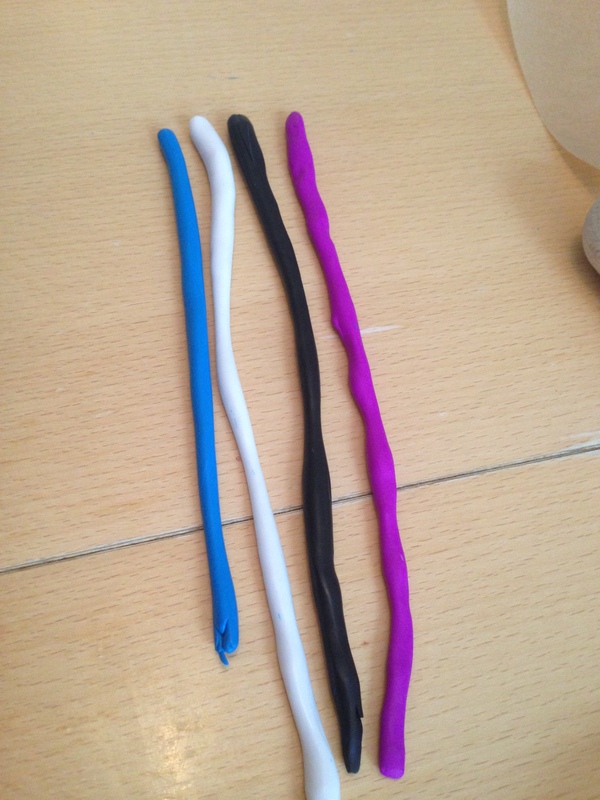 We did a few different colour combinations – but what I would say – is that if you use black – use it sparingly! It tended to turn everything just dark, rather than marbly. I used brown at the bottom of my bowl, purely because its not a nice colour and I couldn’t think when I’d use it again! whirl it round like a snail, then keep adding your marbled worms. 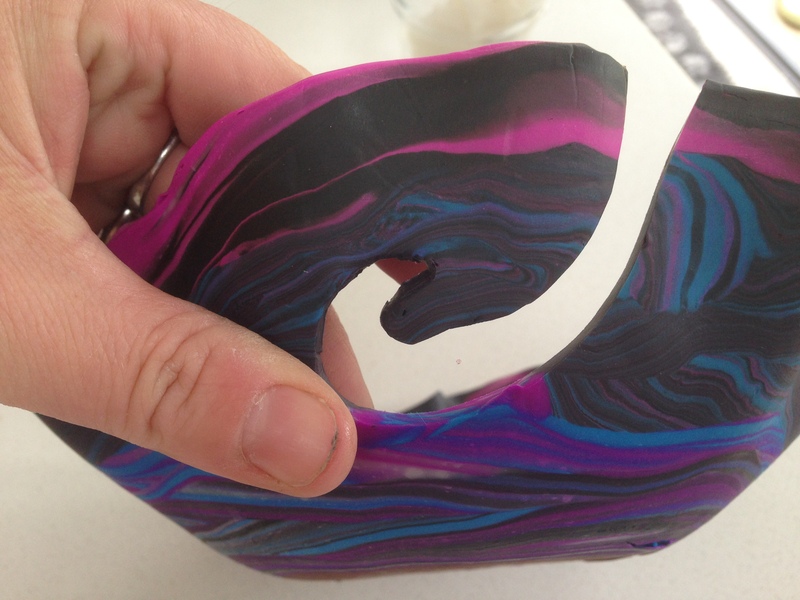 The more marbled the more twisting, but if you twist too much the marble disappears and we were left with a mass of purple clay! 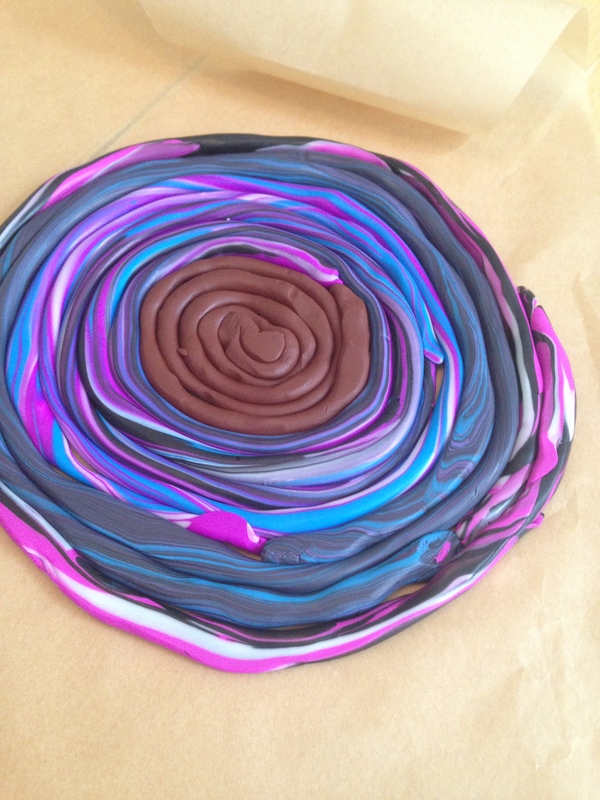 Next to roll it out – and boy was this tough work! 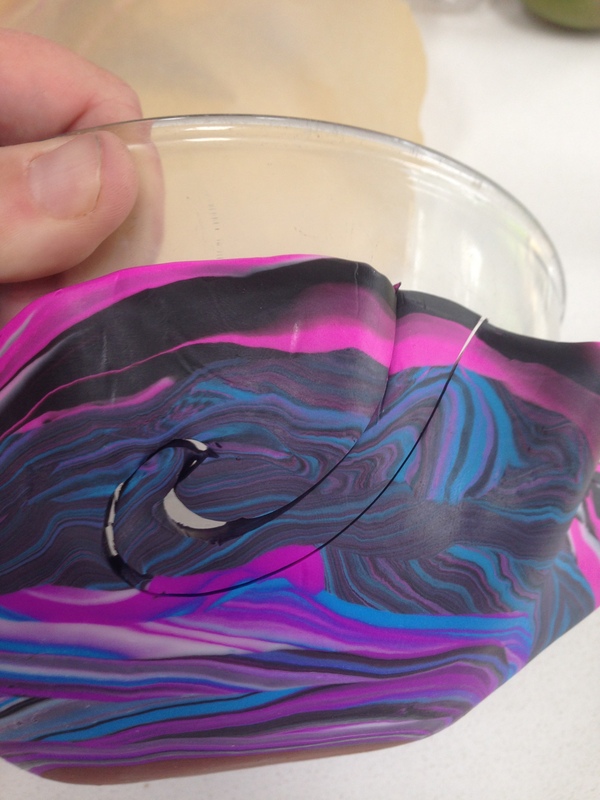 Then it was placed on an oven proof bowl and the notch cut out for the yarn. Then baked in the oven for longer than the packets said – about 20 minutes at 140 degrees C as it was still soft at 10 minutes. I does have a crack in the bottom which developed on cooling – which I’ve superglued – we’ll see how it lasts! BTW more gratuitous pics of robins please! I love them! Oh thank you! I love it. I have wanted one forever. Now I can have one. Well as soon as I get it made anyways. The bowls are soooooo expensive and I have wanted one for so very long but being disabled and on a very limited income, buying one was a pipe dream. Thank you for making my pipe dream become a dream come true!!!!! Think of the color & design possibilities…… Thank you again. You really don’t know how much this means to someone like me. I guess if I was a true craftsperson, I would have thought this up myself but I guess I am not that crafty. Thankfully you are!!!! Thank you so much for sharing your beautiful yarn bowl. The color combination is stunning. Pink is my very favorite color, but I don’t have too much of it in my home decor. I have wanted a yarn bowl for a long time. Just can’t seem to find one in a color I am fond of. And…they are so expensive for me being disabled and on a very limited income. Not now though. I can’t wait to get started on my yarn bowl. Have a lovely day and thank you again for sharing. I can’t wait to try this! Did you bake it on the glass bowl? Yes – a normal Pyrex mixing bowl. It took longer than the packets said! This is a beautiful yarn bowl! Thank you – your bowl is wonderful! I like the extra holes too a great idea!